We auto journalists pride ourselves on our automotive knowledge and our prowess behind the wheel. But ask us to make a car from scratch and most of us young ones will be left scratching our heads. So you can imagine being around 79 fully functional off-road buggies built by engineering students can be quite an overwhelming experience. And such was the feeling for most of the visitors who had come to attend the JK Tyre Baja SAEINDIA 2011 at Pithampur, near the outskirts of Indore. 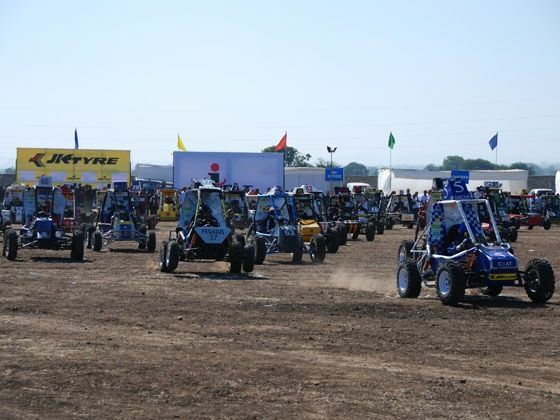 This event which is held annually and is now in its fourth year lets college students design and build an off-road buggy using the same engine from Koehler. But the emphasis isn’t just on the build. Where the real meat of the event lies is in the grand 3-day competition which starts after the 1700 college students from 80 colleges all across India have landed at the venue and put their buggies through grueling tests which included manoeuvreability, straight line dynamics, performance, braking prowess, hill climbing and even a demanding two-and-a-half hour endurance race on the last day. With a total of 1000 points spread across all of the events, who would emerge the overall winner was anybody’s guess. So while G.H. Raisoni College of Engineering, Pune managed to win the gnarly endurance race and also score the top points in the acceleration challenge, they were piped for the top honours by Sant Longewal Institute of Engineering and Technology, Punjab who showed consistent performance throughout and scored a total of 801 out of 1000 points as opposed to the Pune-based teams 768. Close on Raisoni’s heels was another team from Pune – SNK College of Engineering, which managed to score 751 points and finish third in the overall points tally. But there were other awards to be won as well. The Chief Guests to the event, Ambuj Sharma, Joint Secretary, Govt. of India, Ministry of Heavy Industries and young racing sensation Armaan Ebrahim also presented awards for other achievements by the college students. The Technology Innovation award was presented to DY Patil Engineering, Pune, whereas SRM University, Kancheepuram, Tamil Nadu bagged the Go Green Award. The Hall of Fame for Excellence Award was also won by G. H. Raisoni College of Engineering & Management, Pune. The other category award like the Raftaar award was won by IIT Mumbai and Maximum Acceleration Award by G. H. Raisoni College of Engineering & Management, Pune respectively. Green Vehicle Award went to NIIT, Jamshedpur. The students walked away not just with the excitement and a sense of accomplishment for having competed in such a testing event, but also a fair amount of prize money as well. The overall winners, Sant Longewal Institute of Engineering and Technology received Rs. 5 lakh (sponsored by ITW Chemin, Hyderabad) for taking the top honours and also an ATV from Powersports. Prize money for the technical challenges varied from Rs. 10,000 to Rs. 2-lakh with the total winnings amounting up to a heady Rs. 40.5-lakh!